If you have a strong sense of adventure and enjoy outdoor activities like hiking, rock climbing and sweeping landmines, you’ll love geocaching. Geocaching is a real-world outdoor treasure hunting game where players use a GPS device or smart phone to try to locate hidden containers called geocaches. It’s kind of like playing Call of Duty only you hunt objects, not people, and there aren’t any flashbacks to the Bay of Pigs Invasion, only to other unwelcome invasions. Geocaching is a great way to break loose from more conventional forms of suburban entertainment like eating frosting from a can while watching Cupcake Wars. My family’s first geocaching experience was both fun and terrifying. We dodged wild animals, narrowly avoided tree branches, and screamed with fright —and that was just the drive there with our new teenage driver behind the wheel. The bigger adventure began once we hit the trail, after we recovered from the drive and my husband, Chris, un-muzzled my mouth with his hand. Having already logged onto www.goeocaching.com (the official goecaching website) and selected some caches to find in a local wildlife reservation, we began our quest by appointing a leader. We decided on Chris, because he is mature, patient, and held the car keys. “This way,” Chris circled left. “No, this way,” Chris circled right. He seemed to be navigating his own shadow. We snaked our way deeper into the woods and stumbled upon something unexpected— a middle aged couple sitting at a table draped with a white tablecloth, enjoying a romantic candle light dinner over wine and Subway sandwiches. They seemed equally surprised to be met by five muddy heathens and their pet dog. One spoiled romantic mood later, we left the interrupted couple and forged ahead. “Didn’t that look romantic, honey?” I asked my husband. “It looked like a Viagra commercial,” he answered. We continued our search, though we had no idea what we were looking for. We pulled up rocks, tree roots, and one of my daughter’s brand new $75.00 suede boots that had been swallowed by a mud pit. Finally, after what felt like endless searching, someone announced a discovery. We darted about in a panic, trying to untangle our feet from threatening, red vines. It was by accident that we stumbled upon a tree hallow that contained the hidden treasure. “I found it!” my son exclaimed. He reached in and pulled out a Tupperware container masked with camouflage tape. We huddled in excitement as he pried open the lid to reveal: a 1987 quarter, a paper clip, two plastic trinkets, and a rubber band. I expected to hear cries of disappointment. Instead, my children examined the items as carefully as if they were relics from the tomb of Tutankhamun. The value of the treasure was less than a Mc Donald’s Happy Meal, but the kids reveled in their success. We signed “The 5 Amigos” in the container’s soggy logbook and placed the contents back in the container for future generations of geocachers to rediscover. But the adventure didn’t end there. I pulled the first one off my husband. The next three I extracted from my kids. After checking my entire family and the dog I ran to the bathroom to check myself. I removed my pants and immediately found a tick clinging to my inner calf. I tweezed it and threw it in the toilet, all the while cursing geocaching. I conducted an entire self strip-search but couldn’t check my own back. My husband entered the bathroom. He eyed my pants on the floor and raised an eyebrow. “Just check my back for ticks!” I commanded. “I found one,” he said, pointing to my left shoulder blade. We continued to find ticks for days. As for the geocaching, we haven’t gone since. The sport may have been fun, but it came at one expensive pair of boots and one traumatic tick invasion. Instead of geocaching, the next time I want an adventure I think I’ll let my daughter practice parallel parking . 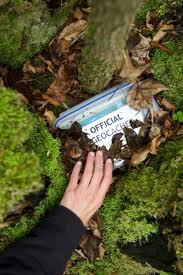 . .
We’ve been geocaching for years! Yet sometimes I get “fake mad” as my wife calls it when I wander around aimlessly in a patch of woods unable to find a cache despite the GPS telling me it’s under my nose. That sounds all too familiar! Wow, family adventure turned Lost in Space. I went geocaching once and got attacked by Big Foot and died. Wow, and I thought tics were bad . . . This was great! Now, I didn’t know what geocaching was when I started reading and now I know never to do it. My husband can’t navigate his way to the supermarket with any sort of consistency. Your husband said those people enjoying their “romantic” dinner looked like they were in a Viagra commercial. Were they in a bathtub? The people in those commercials are always, inexplicably in two separate bathtubs that are outside. Ha! They were not in a bathtub, but we were, (and the dog too) trying desperately to rid ourselves of tics. We’ve been geocaching for a couple of years now and have logged close to 550 finds. Never had an experience like yours but my husband did fall out of a tree once as he was recovering a cache. Wow, that’s great! (The 550, not the fall). Thanks for commenting, Mel. Geocaching = Not For Me. My outdoor treasure/GPS device experience is limited to standing outside the Outback Steakhouse waiting for my beeper to go off letting me know I can come inside…my table is ready. Teaching someone to parallel park is indeed an adventure…and if it lasts longer than four hours you should consult a physician immediately. Good idea! Then my adventure would end with a juicy steak instead of a juicy tic . . .
Love it! Geocaching? We’re still looking for a few things that have been missing since the move from NJ to TX. Most of them are hideous articles of clothing that Jim once owned. Ha! I hear you, Krista! Chris’s tattered old slippers keep making their way back from the garbage to his closet. Maybe I should encourage him to wear them geocaching so they’d get swallowed by a mud pit! Your family adventures would make a great sit com. I have no experience with geocaching but know a few things about teaching a person to parallel park. I’m still teaching it to, not my children, my husband. It sounds like geocaching could be right up your alley! True, maybe I should start with braking and acceleration . . .
Hehe.. interesting activity… almost can imagine the faces on that couple you stumbled on. I’m pretty sure when they planned their romantic interlude the plan didn’t include us! Maybe urban geocaching is worth a shot for the family. Less mud, poison ivy and ticks. More traffic and smog tho. Or digital goecaching which I call blog surfing because I’ve found some real treasures! Sounds like you guys need to wear your tic collars next time. And, your husband sounds as funny as you are. I don’t know if a tic collar would fit around the spiked collar my husband likes me to wear . . .
Wow! Your entire family was overcome with sudden involuntary contractions of the face, neck and shoulder muscles after geocaching? Sounds like the FDA needs to start putting warning messages on GPS’s. It really was fun. But Sylver, you can make anything fun (with or without frosting) because you’re just that kinda gal! I was reading along, thinking that this at least sounds safer and more fulfilling than snowboarding, until I got to the tick part. I might suggest a family television night. The worst dilemma might be who gets to control the remote. Sherry, thanks to your reply, I realized I had mispelled “tick” throughout my post. Damn spell check! (and my weak spelling . . .) I made the corrections, better late than never.